We believe branch transformation is entering a new stage. 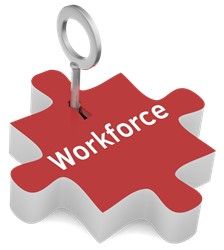 For growth, leaders are looking to unlock the value of their greatest asset -- the workforce. Kiran Analytics – a leader in intelligent branch transformation – announced today that it will share its branch workforce optimization insights at three major industry events -- CBA Live 2016, Retail Banking 2016, and International Retail Banker 2016. CBA Live 2016, the premier event of the Consumer Bankers Association, will be held on March 7-9 in Scottsdale, AZ. Retail Banking 2016 Conference, the premier event of the retail banking industry in the US, will be held on April 6-8 in Las Vegas, NV. International Retail Banker 2016, the premier event of the retail banking industry in the UK, will be held on May 19 in London. To keep up with changing consumer banking behaviors, retail banks have been making significant technology investments in digital banking and branch automation. They have also been closing unprofitable branches, eliminating teller lines, and reducing operating hours to improve operational efficiency. At the upcoming industry events, Kiran Analytics will be sharing insights on how its innovative advanced analytics solutions are helping retail banks optimize their workforce for growth. Kiran Analytics drives intelligent branch transformation for retail banks through the application of predictive analytics. Kiran’s solutions have been deployed in over 10,000 branches helping to forecast optimal branch staff levels accurately, hire better people faster, and to plan and schedule resources efficiently. As a result, retail banks increase sales and customer service while reducing operational costs. Kiran Analytics is a member of Bank Administration Institute (BAI) and Consumer Bankers Association (CBA).